I love it when I can give my clients exactly what they are looking for in their wedding pictures. This photo is a perfect example. The bride told me that she had the inside of her husband’s wedding ring engraved as a surprise for the wedding day. She asked me if I could get a photograph of the inside of the wedding ring. As an experienced wedding photographer I carry an arsenal of Nikon digital cameras with a full compliment of their finest lenses. One of the lenses I carry is specifically designed to take a photo like this. It is called the 105mm Micro Nikkor lens...a close up macro lens of the highest quality. 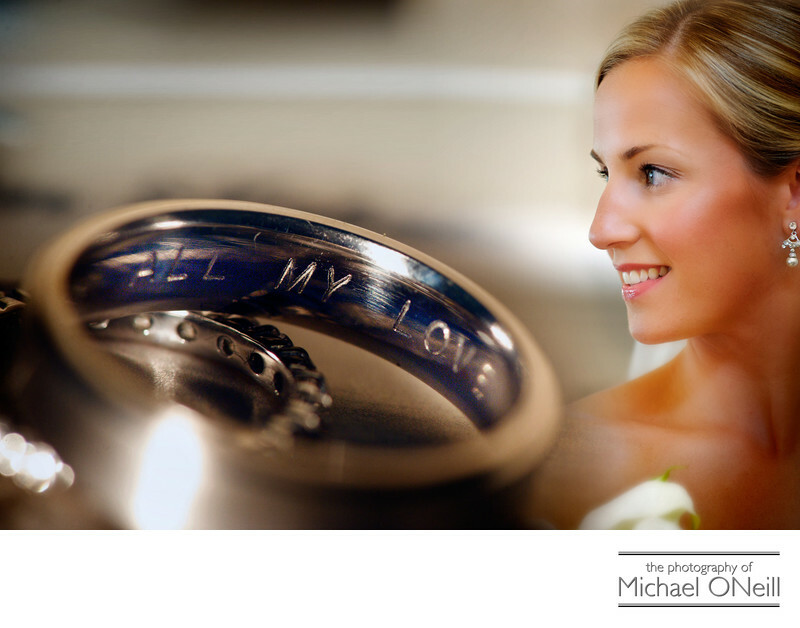 By using this lens I was able to get a wonderful picture of the engraving on the inside of the groom’s wedding band. Back at my East Northport, New York studio I composited the image of the ring with a portrait of the bride to create the final picture you see here. It took some refined skills in Photoshop to make this image possible and my client was thrilled with the result. That’s what it is all about for me...giving my clients everything they can dream of to remember their special day.